Onlookers amidst ivory waiting to be crushed at NYC’s Ivory Crush on June 19th, 2015. 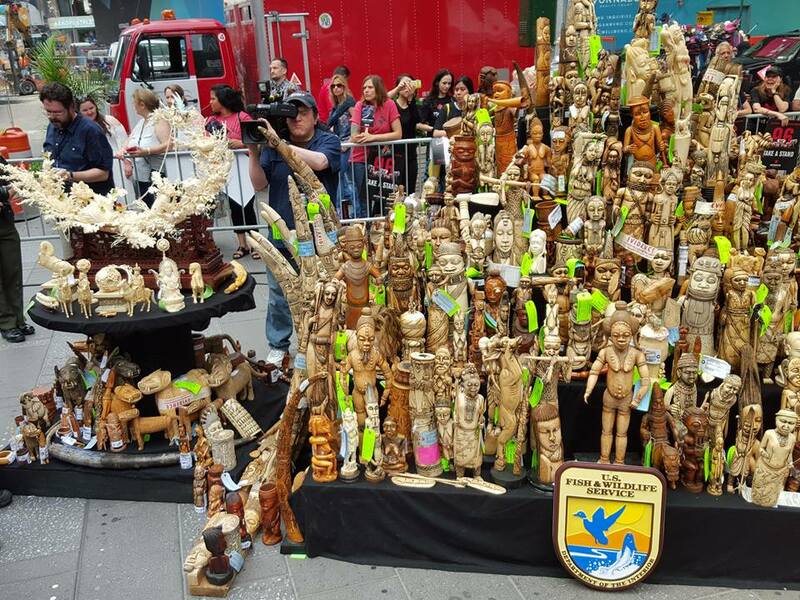 On Friday, June 19th, I went to New York City’s Times Square to watch the United States Fish and Wildlife Service, together with NGOs such as NRDC, Wildlife Conservation Project, and others, get together to destroy over 1 ton of ivory. We are losing elephants at an alarming rate – up to 96 individuals a day – or 1 elephant every 15 minutes. I spent most of my childhood in Sub-Saharan Africa. Days were often spent visiting David Sheldrick’s Wildlife Refuge on the outskirts of Nairobi. Back then it was an intimate affair where we could get up close and personal with young elephants whose parents were victims of poaching. Weekends were spent in the game parks watching these animals lumber through eye-high grass. Once, on our way back home, a matriarch blocked our way to our airplane. We waited in a stand-off as she continually mock-charged our vehicle. Her ears wide, head high. 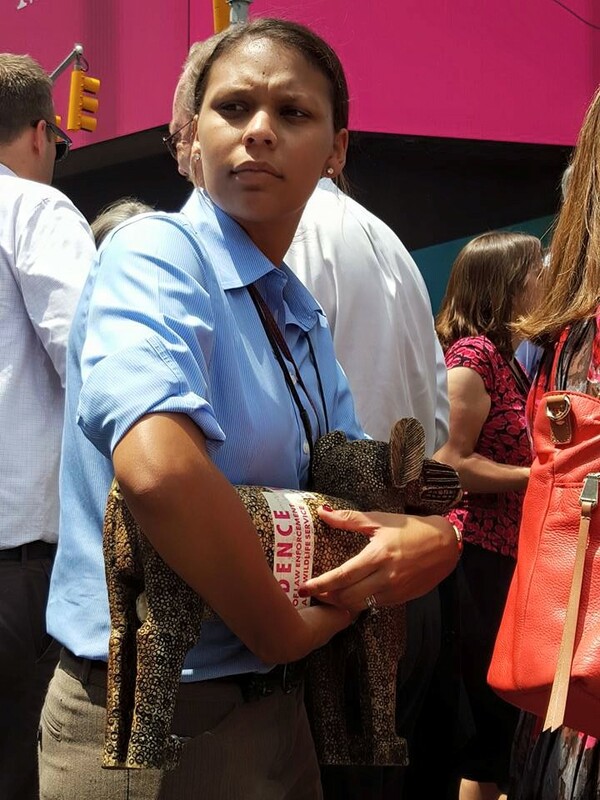 I went to the Ivory Crush in Times Square because I take a strong stance on poaching, but I wasn’t sure if I supported the destruction of ivory to send that message. As a conservationist and a poet, I wanted to get the pulse of the event before I cast my vote. Many well respected scientists, environmentalists, and organizations support the destruction of ivory. Yet I couldn’t help but balk at the idea. A little before I moved to Kenya, then President Daniel Arap Moi set the precedence by burning 12 tons of ivory in Nairobi National Game Park. It was the first event of its kind. Many hailed it as taking a strong stance on poaching, and many other countries followed suit. In the last four years 37 tons of ivory has been removed from the market and destroyed. Has the ivory market responded? At Friday’s Ivory Crush U.S. Interior Secretary Sally Jewell said “we’re not only crushing ivory, we’re crushing the ivory market.” The ivory crush on Friday was the sixth ivory crush that has taken place in the world in the last two years. Has the ivory market responded? Yes. But not favorably. Since 2011 ivory prices have doubled. According to a report, elephant poaching has also increased. If you look at the trends and numbers, it appears that these ivory obliteration events are counter-productive. By destroying the ivory the prices and demand is going up. Ivory is getting scarcer with each tusk that is destroyed. This makes poachers scramble to try and kill every elephant in sight. They are now going after younger elephants with smaller tusks, and the large tusker gene appears to have been wiped out. But what are the alternatives? Selling the ivory is out of the question. This sends the message that poached ivory has value and trading it is acceptable. Even if the ivory is used for altruistic purposes – such as increasing ranger capabilities to battle poaching – it is still putting the ivory back in the market that we are trying to terminate. Likewise stock-piling the ivory is also unfavorable. There have been some “dirty officials” that leak out the goods from these stockpiles and they also create a target for crime, not to mention require a great amount of funds and manpower to keep safe. Some argue that the market should be flooded. I am not quite clear how this would happen as we cannot release stockpiles. Ivory also is not necessarily cultivatable. American alligators were on the brink of extinction in the 1970s. There was a high demand for their skins for luxury goods. What ultimately saved the alligator from extinction is farming them. But you cannot farm elephants the way you can farm alligators. A single alligator lays 35 to 50 eggs a year, sometimes up to 90. Once the babies are born, they’re left to fend for themselves. An African elephant has the longest gestation, more than any other animal on Earth. They give birth to only one calf, which needs to stay with its mother for 16 years. This is not sustainable for the ivory trade. There are many alternatives to ivory, however. A common alternative is bone, a byproduct of the cattle industry. It can be carved just as intricately as a tusk. Additionally, elephants aren’t the only animals that have ivory. Hippos, walruses, whales, and warthogs do as well. The latter is much more sustainable than the others, although they don’t yield giant tusks like elephants do. There is also a tree called the Tagua that produces a giant nut (up to 20”) that is remarkably similar to ivory. Jewelry artists have said “it is beautiful, with natural whorls of color in its satiny ivory surface – less brittle and more durable than bone, less porous and polishing up more nicely than antler.” The tree, also known as the “ivory palm,” produces hundreds of nuts a year, therefore a much more renewable product. The message that all these crushes want to send is that ivory has no value unless it is on an elephant. This is a tough message to send when the prices and value of ivory is higher than ever. Unfortunately, I have no answers. I went to the crush to try to get some, but after seeing the ivory get destroyed I left with a more sour taste in my mouth than a positive one. Before the crusher was turned on, many individuals gave colorful speeches. They stated facts about elephants, statistics from the ivory trade, and kept reiterating why they were destroying the ivory – to send a message that ivory is useless. Once the crusher was turned on though, I felt people’s actions spoke louder than their words. What disturbed me is the rather celebratory sensation around the event. These are pieces of brutally murdered individuals. 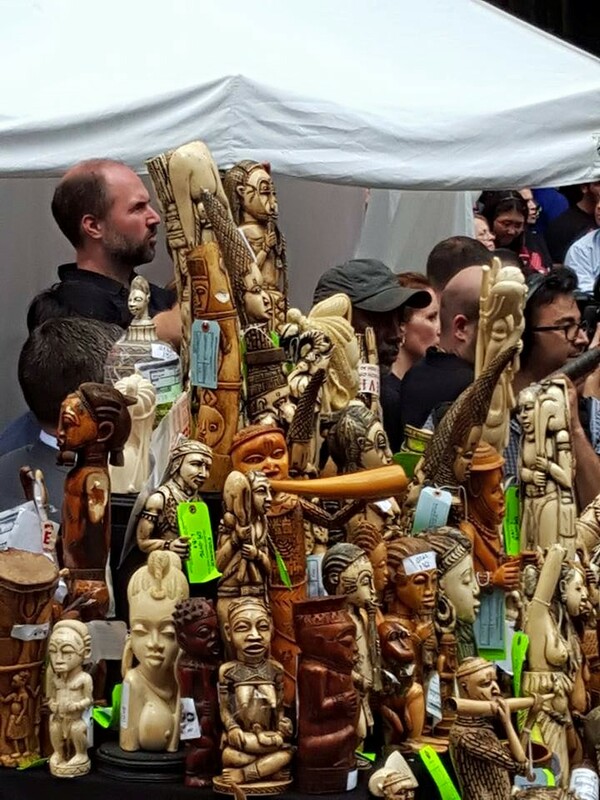 Here are notable officials and activists posing and cradling intricately carved pieces of ivory. They were all quick to take the photo-op, holding up a horse, a figure, and more disgustingly, a carved elephant, before placing it rather unceremoniously on the conveyor belt. Once the ivory rode up this contraption and into the crusher, people seemed to forget about it. Few people sat around the machine. They seemed more interested in the ivory (you know, the stuff we’re not supposed to be interested in) being loaded than the process of crushing. And it wasn’t so much crushing as it was chipping. It was absolutely horrific. 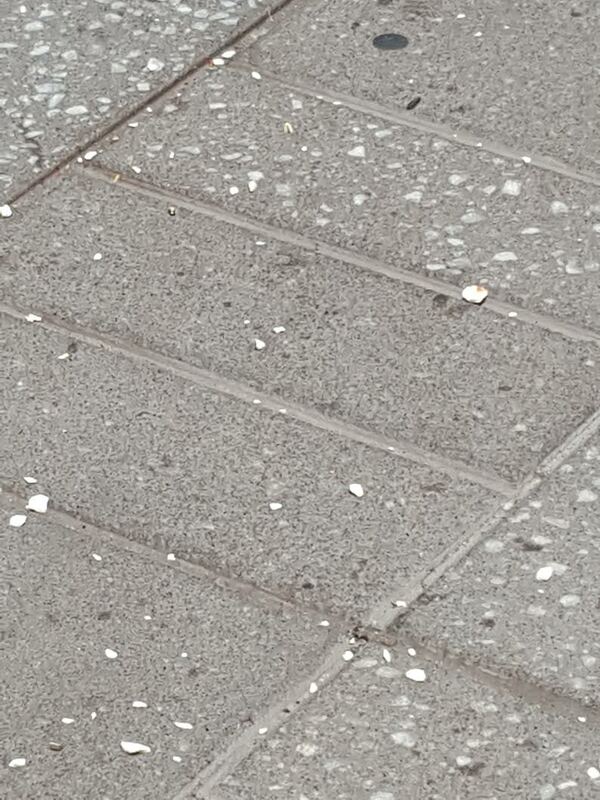 Not only did plumes of ivory dust rise in the thick New York City air, but also chips of ivory kept flying out, landing up to twenty feet away. No one seemed to notice. Once in a while a large piece of ivory shrapnel would come catapulting out of the chipper and a United States Fish and Wildlife Service agent would unceremoniously pick it up and toss it in a pile to be chipped up further. At the opposite end the ivory remains swooshed and rained into the bed of trucks. Interestingly, it was this shrapnel that the officials seemed more concerned with guarding than the whole pieces, not allowing any photographs to be taken or anyone to get near. I waited until crowds began to thin to see what would happen with the shards that littered the cobbles, but nothing happened as long as I stayed. 1 ton of ivory waiting to be crushed.